The latest offering comes from Afghanistan. 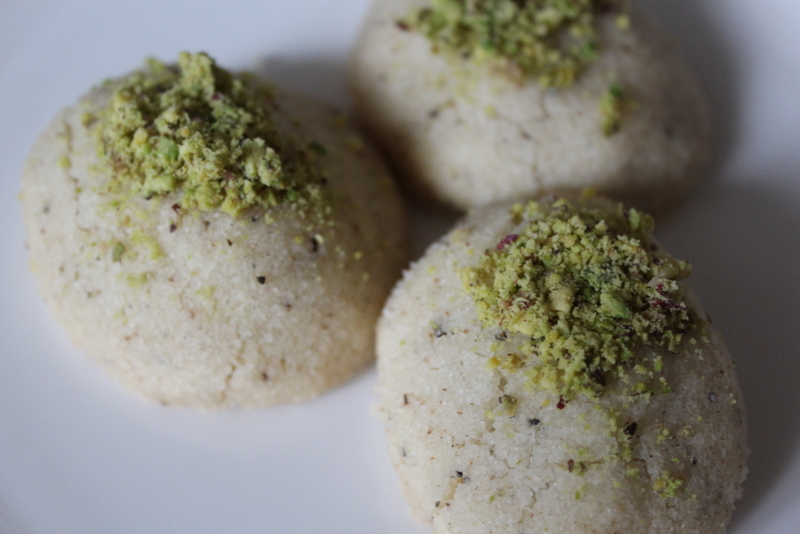 I had never heard of Khatai cookies, in fact I’m not sure if I’ve even eaten any dishes from Afghanistan, and if I have, I couldn’t tell you what they were. So this is a completely new thing for me. When looking for recipes from Afghanistan I just did a quick google search and these cookies came up. I did also find a recipe for Brides Fingers (Asabia el Aroos) which did sound really yummy – almost like a simpler version of baklava, so it was tempting to make that instead, but seeing as I am definitely going to make baklava during this challenge (and the point of this was to try out different things) I thought I should go for the Khatai cookies. 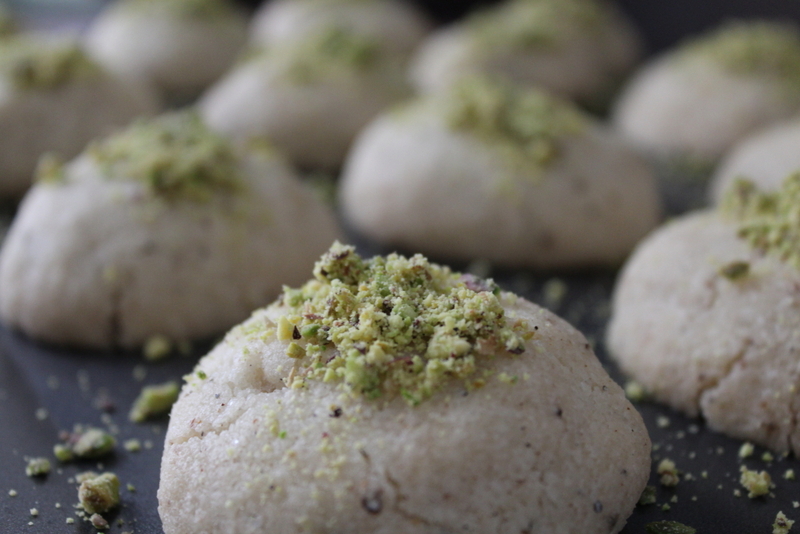 I can’t work out if these are supposed to be called Nan Khatai cookies, or just Khatai as there seems to be various options online, but I’m sticking with Khatai as that’s what it said on the recipe I found. These biscuits are apparently a popular Indian and Pakistani biscuit, so I’m now wondering if they originate in India, but I’m not entirely sure. If anyone can enlighten me I’d be grateful. 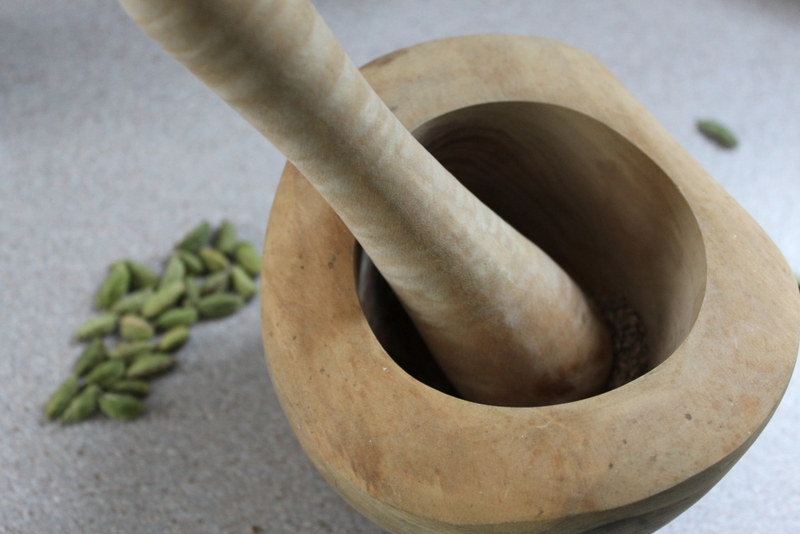 They were very easy to make, the only time consuming bit was grinding down the cardamom seeds (I couldn’t find any ground cardamom in the shops), so other than that they were incredibly quick. I can’t work out if I liked them or not. They were very sweet (hence thinking they’re more likely to be from India), but the cardamom did cut through the sweetness of the sugar a bit. They had a weird texture as well – the outside was very crumbly (you definitely needed a plate when eating one as mine were too big to eat whole), but when you bit into them the inside was quite hard. Despite all that, they were quite moreish and we did polish them all off. So I’d try them if you want to taste something a bit different as they take very little effort to make, so if you don’t end up liking them, you haven’t wasted much time or energy. My only tip would be to make them a bit smaller so you can eat them whole and you might also want to consider replacing the oil with butter as I think it would give the cookie a richer, creamier taste. Some recipes also include baking powder and others suggest using icing sugar, so have fun playing around! Preheat the oven to 180C. Mix the flour with the sugar, and crushed cardamon. Next, add the corn oil and mix well. Make the dough into two inch round balls and put them on a cookie sheet and bake for 15min, or until lightly browned. 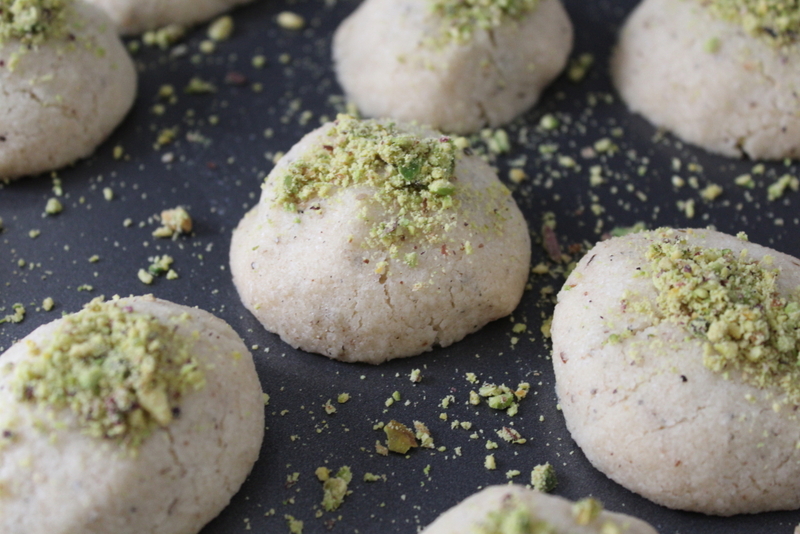 Sprinkle finely ground pistachios on top of the cookies while they are still hot.